HAVE YOUR EATING HABITS GONE TO THE DOGS? 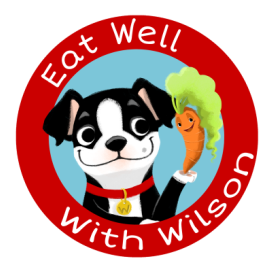 ﻿﻿﻿﻿﻿Come with Wilson as he learns to maintain a healthy and balanced diet. There are no lectures or boring homework assignments at Doc Matthews's office. 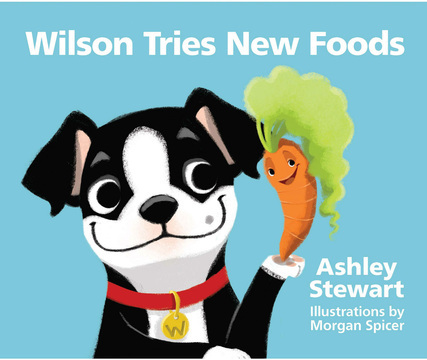 Instead, Doc and Wilson's new friend, Sprout the Carrot, guide Wilson and his mom on a journey through the singing food groups where they learn all about healthy food choices. They also learn what ingredients to watch out for and how to shop for healthy foods. Read what happens in Wilson Tries New Foods, and soon you'll discover, like Wilson, how to run faster, jump higher, and learn new tricks!